On January 15/16, 2013, a reported 100-106 people were killed in the farming town of Basatin Al-Haswiyeh (Orchards of Haswiyeh) or just Haswiyeh (Arabic الحصوية, meaning "gravel"). (for more on the name, see talk page) On the northern edge of the central Syrian city of Homs (locatable here on Wikimapia and here on Google maps), it's dominated by orchards and small fields, with only about 1,500 residents, plus refugees from other areas, surely reduced now. As the story was first announced by opposition sources via the world media, the massacre was of "whole families," as many as 13 of them, including 32 from one specific (Sunni) family. 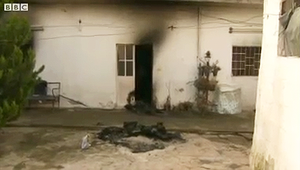 The victims were reportedly shot, slashed, and whatnot and then burnt in their homes. Not surprisingly, the killers are reported as Alawites and Shi'ites from surrounding villages. For the first time, it's being alleged this is part of a strategy of creating an Alawite/Shi'ite/Christian breakaway state, purified of Sunnis in advance (see Sectarian Claims. This was all conveyed by opposition/rebel sources by phone and internet to the outside world. 2.2 The Other Side Emerges? 3.4 Bodies Tied to Trees? Telegraph: "Haswiyeh is not far from the region of Houla, where 108 people were killed over two days last May. The UN described the Houla killings as a war crime perpetrated by the government forces and shabiha militia backing Assad's regime." The town's proximity to Al-Houla, site of the Houla massacre is often mentioned as helping to suggest the government is responsible. Clicking that link might be instructive. AP's Bassem Mroue and Zeina Karam pulled this together with other activist claims into the spectacular, genocidal, grand strategy behind these patterns: "Sweep of majority Sunni village could pave way for Alawite enclave"
By combined implication, this breakaway state will not be just a greater Latakia for the Alawites, but for other Shia, Christians, and apparently everyone but Sunnis. But to get it, they need to liquidate the local Sunnis, in the same kind of fits and spurts country-based rebels could pull off, if they wanted. The implications are clearly troubling, and also troubling in less clear ways. Not one, but two British news teams swiftly brought some questions into the mix, a-la Alex Thomson's pioneering approach. Most journalists gather their reports by phone from activists and from available sources, note that they can't verify anything, and use the standard fallacies to explain that it's the Syrian government's fault. In contrast, ITV's international editor Bill Neely and a team visited the town (given as "Basatin al Huwaisa") just as news broke on Thursday, January 17. "Homs has been the scene of several massacres," he would write. "More than one has been contested, as one side blames the other for the atrocity. This is yet another." BBC's Chief International Correspondent, Lyse Doucet, headed a team that arrived on Friday, the 18th. "This is a war crime," she would quip. But who committed it came through less clearly than it did in the standard SOHR-type reports. Lyse Doucet heard the same: "Soldiers who escorted the team to the area said hundreds of men from a militant Islamist rebel group, the al-Nusra Front, committed the killings." Of course they would say that, some would observe. The local support was there. "One woman told the BBC the same," the main article passed on. But another BBC article from the 19th, more directly from Doucet herself, noted "others in the village confirmed the army's account." Note the difference between singular and plural. BBC's Lyse Doucet was able to salvage some doubts about the picture she saw, which have been amplified successfully by others and helped neutralize the effects of this reporting. Soldiers, mainly, were cited as the source, with a local or locals passingly mentioned as supporting it. More attention was given to the lone dissenter. But out of earshot of the official Syrian minders, another woman said the army was present at the time and that some soldiers even apologised for the murders, saying others had acted without orders. Errors: No locals are cited as supporting the soldiers, the one disagreeing with them is transformed to more than one, and those are given as, implicitly, representatives of all villagers. This constitutes a serious distortion that turns the established record almost completely on end. It's made to seem that even on-the-ground reporting (of the kind NYT, Reuters, AP, and almost everyone else avoids) still manages to support the initial activist version. But that's simply not true. Doucet's report managed to set the stage quite well for this mistreatment. Being in touch with the Al-Nusrah front, the BBC had gotten a denial, that they refrain from killing civilians. Both sides say they do, she notes, but one is lying here. When the off-camera woman speaks and implicates the soldiers, the b-roll footage they chose was of burned remains and then soldiers, their boots and rifles, as a reminder. Then she reminds us, over footage of some charred bodies, that "activists say this was the work of pro-government militia known as Shabiha. Some day, we’ll know for certain who did this. A war crime happened here." (emphasis in original). The someday is presumably in the inevitable future period called "Post-Assad." The activists will probably be "proven" correct here and everywhere else. One woman seen on video retelling her story in Arabic, in Neely’s ITV news report, is said to fail to identify the killers, describing them only as armed men. "The armed men killed my three children, she says. They came at night. I couldn't tell who they were. We're just farmers. Now we have nothing." This is unusual; all other survivors/witnesses/informed sources are quite clear who they believe the killers were. That they'd be hard to see at night makes most sense if they were wearing black, although she doesn't specify that. Presented with the conflict between Shabiha or rebel terrorists, the ever-inventive James Miller at Enduring America tried rejecting both. Miller speculated that other parties, dressed as al-Nusrah to trick people, carried out the killings. "The identity of the attackers may have been confused, depending on who saw them ... it's possible that the attackers were meant to look like Jabhat al Nusra.” But he noted that the described outfit with Islamist-slogan headband “is hardly a positive identification,” and in fact doesn’t sound exactly like their known costume style. He raised the possibility that “Al Nusra has been framed,” either by other rebels (as he says Neely suggests) or by “Lebanese men, perhaps from Hezbollah” as one unverified source claimed. As support, he pointed out “there is more evidence of larger numbers of Hezbollah working in Homs than Jabhat al Nusra.”  Even if this is true (unverified, hard for anyone to really know), it ignores the swathes of coutryside to the north and west where rebels and Sunni Islamists have numerous held towns to base attacks from. In case this false-flag notion has any merit - and it’s worth at least brief consideration - there are a few inherent problems. First, there was no black flag cited, the best clue to fighting under the flag of Al-Nusrah (especially in a fake operation to that end). The claims that it was them seem to be guesses, perhaps to tap into known anti-Al-Qaeda sentiment. The fighters might have never even claimed that, and were just some other dark Jihadists. Furthermore, activist reports didn’t mention how they saw through any such ruse to tag the true killers, and don’t even mention the ruse at all. They said that bused-in Shabiha and security forces, not the same disguised as Al-Nusrah, carried out the killlings. Either their sources didn’t see the black-clad killers in action, or there were no no such people (they wore other/regular clothing), or there were black outfits on the killers, but the activists' (black-clad?) sources chose not to mention it. However, this interpretation with only 30-40 does not jibe at all with the opposition claims of 13 familes, one family with 32 killed, and large numbers suggested from others. This is worth a sub-section. Reuters reported, on the 19th from the SOHR, a set of three families (two unnamed) suggesting that at least 63 of the victims came from these alone (unless the 14 including 3 is the same, in error, as the one of 17). Activists said 17 members of the Khazam family had been killed during Tuesday's raid on Basatin al-Hasawiya. "The Observatory has the names of 14 members of one family, including three children, and information on other families who were completely killed, including one of 32 people," Rami Abdelrahman, head of the Observatory, told Reuters. That would make 46 actually reported by SOHR. Neely, speaking to non-rebel locals, was given "the names of families who had been killed," including (at least) "members of the the Hamza family, the Khoulis and Ghalouls." That's four families named. It became clear many people had been killed in the streets, in houses and in orchards. The bodies of those in houses and streets had been removed but the orchard was in the open, and snipers were still firing. Bodies were still there, they said. He specified "I did not see any bodies," but he didn't seem to doubt the claim. There is a sick and compelling logic to tying victims visibly to trees, inviting loved ones to recover them, and then sniping anyone who tries, but no one has specifically proposed that yet, and the whole bodies-in-the-orchards sub-story remains unclear. James Miller passed on, from a discussion with Bill Neely of ITV, that "the river divides the village, half of which the rebels control and the other half of which the military controls. The rebels use the orchards and nearby homes to attack the Intelligence Headquarters to the east." [Wikimapia has an entry for "الحصوية" that highlights a broad area including a small patch of built-up streets like both video reports show. This must be the half the government can bring them to, the near (east) side and the north-center, anyway (see more detailed map below). And there's the much larger area of scattered homes set amongst orchards. The town part stops at the Orontes River, as shown on the inset map, with the green stretch residing mostly across it to the west and southwest. Wikimapia and visual common sense indicate (as shown here) the military intel/academy/artillery base/army terrain area is to the west of town, not the east, nearer the orchard half the attacks were/would be launched from. Doucet had soldiers, corroborated by locals, who “said hundreds of men had entered the village from adjoining fields.”  To the south is more orchards and the bulk of Homs, to the west and north are city areas probably under government control. So the direction of entry is most likely from the northwest, where orchards soon yield to fields, and a bit off to places like Ar-Rastan, Al-Houla, Aqrab, Mazraaf, Halfaya, etc., where hundreds of rebels can gather and act at a time. 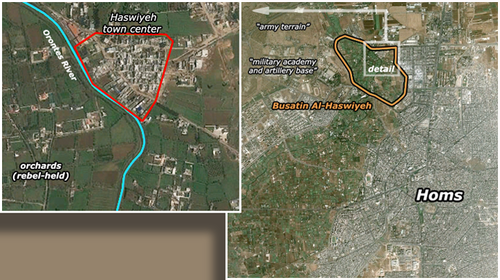 They'd have to cross the highway and over or very near the "army terrain" to get into Haswiyeh's orchards. But otherwise it's small town, fields, and back-roads all the way from their closest known hotbed of Taldou, 20 km northwest. As support for that, rebels said the killers came in the opposite way. The east end of town, closer to government-controlled Homs, has a factory of some sort with piles of perhaps clay-rich soil scraped-up nearby. This might well be the "Al Boushi factory for ceramics" cited by Homs Up-To-Date as the Shabiha killer congregation point. It's next to the mosque, and was recently built, appearing on satellite images as a construction site in 2011, and as complete in early 2012. The square tower went up early, over a pit some underground firing area, apparently. Both ITV and BBC teams were escorted in from the east, on a road right to a tower of this factory area. The grounds are also where Neely and his local witnesses walked and talked, the same tower visible. The base from which the army escorted both journalist teams is at the other end of that road, in an unsure location. It was apparently at or near the massive sugar refinery. The proximity of that to the alleged massacre parking lot will not be lost on some, and that's likely why the activists said the killers came in that way. The killing locations are of course a clue, and they tend to support the locals, not the activists. Doucet says in her BBC report "most of the killings took place in houses down this hill," with a heavily tree-lined dirt road sloping down to a walled complex of large, red-roofed buildings. That would put the kill area on the west end of town, here on GM. , circled in red below-the northwest end of town. It would seem the rebels could have entered this nearest part of town with more scatted people/resistance, crossing where the river is at its narrowest, and a crossing (through a building?) lays nearby. They would most likely be on foot at this point, and dragging the bodies back would be a hassle. As for the other version, these homes are clear across Haswiyeh from the possible ceramics factory. For the Army/Shabiha/Shi'ite/Hezbollah killers in the activist story, this would require a drive of at most 0.33 km from/past the sugar plant, parking the buses there at the east edge of town as reported, and then a walk of the same distance or more through town, when there is a perfectly drivable road all the way there. How many of the killings and abductions were in the rebel-held orchards and homes across the way is unclear. Many lived there, with even less concentration and presumably less protection. Some people say some of them wound up tied to the trees they tried to hide in (see above). As mentioned above, Bill Neely's ITV crew was shown a home where, it was said, a woman and her five young children (the oldest seven) were killed after refusing to let the rebels have the roof. They were burnt in a side-room the locals said, and that room had clearly been burned thoroughly, with a less-charred blanket where one of the bodies had been. In the outer room next to it, laundry hangs on a line, and an empty clothes basket lies in a puddle of blood on the linoleum floor, with a smear showing where the victim was the dragged away. In that spot, however, a man - possibly a rebel fighter - was killed. Syrian private broadcaster Addounia TV showed the scene in a report of Jan. 17, before his body was removed. The nature of his injuries and cause of death are unclear (third image below). They show the same charred room to the side ITV was shown. It's not certain where the home Neely was shown is located, but most or all of his exterior shots seem to be on the east edge of town or in the open areas right next to it. BBC's Doucet took a foray much further in, due west to the top of the hill overlooking the bad place at the far end of town. Only by a safer roundabout route (northern, presumably) did soldiers get her up closer to where some victims, charred ones only, had still not been removed. She had just said that the soldiers said they had already removed the bodies - and this was the 18th, at least two days after the killings. This, and the fact that bodies were left behind and not re-claimed by the hypothetical rebel killers (who usually do truck away and copiously video-record the victims they frequently "find"), are both interesting aspects of this case worth considering. Considering this claim of follow-up raids in the farms that almost have to be west of town - and referring to the big area map above - did they get there the same way retreating rebels would have? Or would they drive back and the long way around to further punish these families for being so helpful to the rebels? The Syrian Observatory for Human Rights urged the UN to send a fact-finding mission; As quoted by the AFP, Observatory member Rami Abdelrahman said “this needs to be investigated by the United Nations.”  The SOHR's Facebook page said "We urge the Office of the UN High Commissioner for Human Rights to send an international investigation team to Homs immediately, so as to investigate and fully document the massacre in order to bring all those responsible to justice." This is unlikely to happen, in part for reasons the SOHR is familiar with. Asking for a similar investigation of killings in Ras Al-Ayn, they said "we also bring to the UN's attention that they cannot refuse to send a mission by using the Syrian authorities refusal as an excuse, since the regime has no control whatsoever on that part of Syria." That "excuse" would probably work in government-held Homs, and would likely be cited if any explicit refusal to investigate is ever issued. “Media reports today [Friday] from the scene of mass killings in the village of Hasawiya outside Homs said whole families were among the dead in horrific circumstances,” said Maria Calivis, Unicef regional director for the Middle East and North Africa. This page was last edited on 18 June 2015, at 11:09.